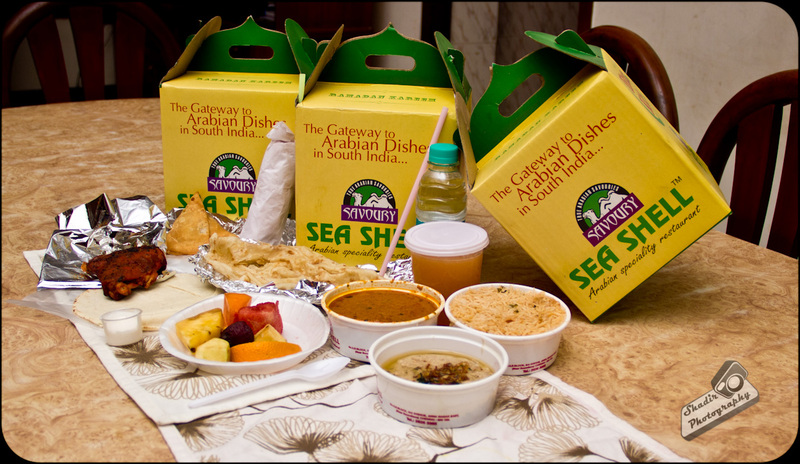 It's been raining Iftar Packs all over Chennai. Every Muslim owned restaurant in the city and even some non-Muslim restaurants have gone out of the way to woo this particular cliental this Ramzan season. 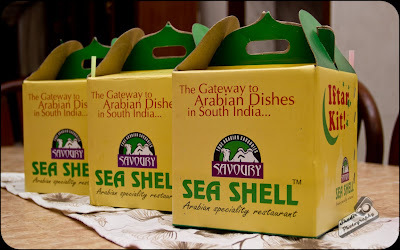 Hopefully my last stop in Iftar boxes this year was at Sea Shells, Anna Nagar. The entire box costs - Rs 280/- plus taxes. Two Arabian speciality restaurants fighting it out on the same side of the town this Ramadan. So the food has got to be ultra competitive. I have already tasted from the first and this is the next. Firstly the fresh juice served in the box was the Papaya Juice which could be the perfect start to breaking a fast. The Vegetable Samosa is really large and it kind of reminded me of the samosa's from Sree Mithai. Coming to Chicken Shawarma, this is by far the best shawarma which came out of an Iftar pack. Really juicy and loaded to the brim with chicken. BBQ Chicken with the Khubbus was perfect. The chicken remained tender even though it was cool. Haleem in this box is the best in the city this season. If you are a Haleem lover do not miss it. Perfect soft texture, combined with great flavor beats the other haleems hands down. The negative elements of the box the Mutton Biryani was a little dry and the Chicken Gravy was a bit gingery. But overall this Iftar box is the best I have had this Ramzan Season. One box would easily feed two! Sea Shells, Anna Nagar is near the the main roundtana in Anna Nagar East.